Well, I just don’t know what to think about this. October 13 is National Yorkshire Pudding Day—in the United States, a country in which Yorkshire pudding is all but unheard-of. To be honest, I don’t know if I’ve ever eaten a Yorkshire pudding, and considering culinary proclivities, that fact shocks even me. 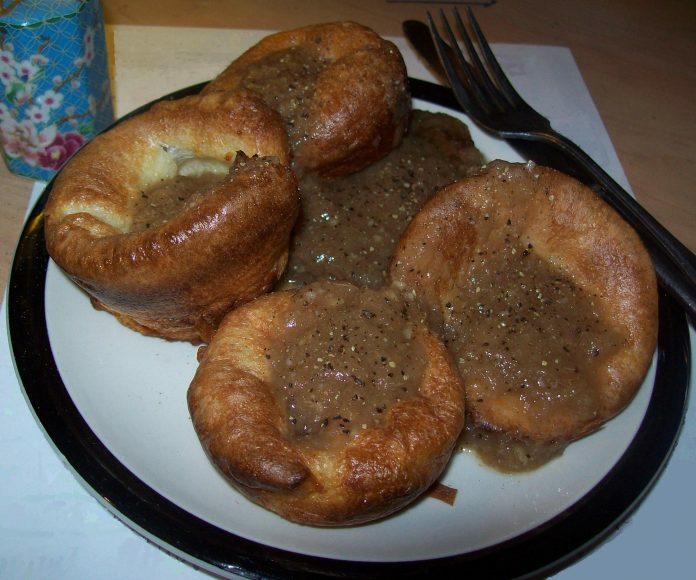 For those of you who, like me, grew up in a country where Yorkshire does not exist and the word pudding exclusively means a sweet, milk-based, custard-like dessert, let me acquaint you with Yorkshire pudding. It’s neither a custard nor a dessert; it’s sort of a pastry—a batter baked in a pan or muffin tin in such a way that it puffs up on the sides and hollows out in the middle. This is a savory food, often served for Sunday lunch, and usually with gravy. If you feel like trying to make Yorkshire pudding today, I’m sure you will find suitable instructions on the web. If you are in North America and hope to find it in a restaurant…good luck!